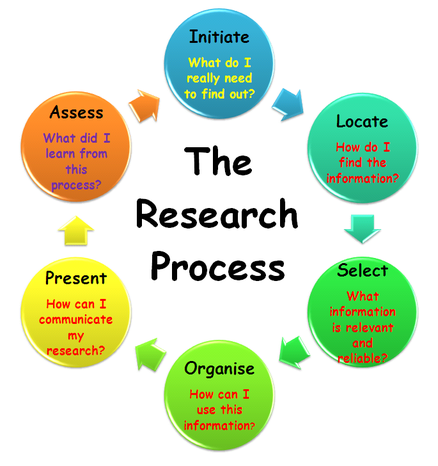 The Research Process is a step-by-step information skills framework that improves student metacognition by making the learning process explicit. Information literacy skills should not be taughts as isolated incidents, but as connected activities that develop ways of thinking about and using information. 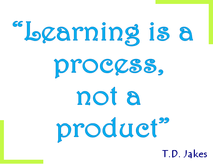 Best practice for addressing Information Literacy in the curriculum is by embedding The Research Process in Inquiry Based teaching and learning programs. Seek out your teacher librarian to help with planning and team-teaching information literacy with your classes (ASLA 2004; Goodnough 2005; Rytivaara & Kershner 2012). • What do I still need to find out? • What sources do should I use? • How do I find the information? • Have I enough information for my purpose? • What will I do with this information? • With whom will I share this information? • How will I communicate or share this information? • How can I compose more sophisticated written responses? Eisenberg, M. B. (2008). 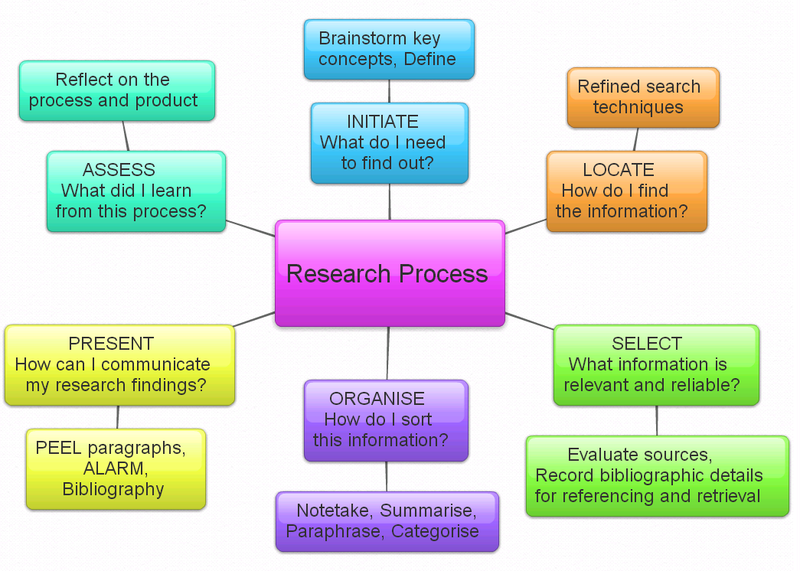 Information literacy: Essential skills for the Information Age. Journal of Library & Information Technology, 28(2), 39-47. Goodnough, K. (2005). Fostering teacher learning through collaborative inquiry. Clearing House, 79(2), 88-92. Maybee, C. (2015). Preparing Today’s Learners: The Role of Information Literacy in the Adoption of Innovative Pedagogies. ​Libraries Faculty and Staff Presentations. Paper 92. University of Southern Queensland, Toowoomba. ​Rytivaara, A., & Kershner, R. (2012). Co-teaching as a context for teachers’ professional learning and joint knowledge construction. Teaching and Teacher Education, 28(7), 999-1008.